On a late November, 2009 evening at very nearly dark, I walked with young puppies Sonic and Seiko as they traipsed and tusseled in the field. I'd taken photos of them earlier but light was almost gone and we were heading home. On the back side of my small pond, I looked through some trees and saw and snapped this picture. 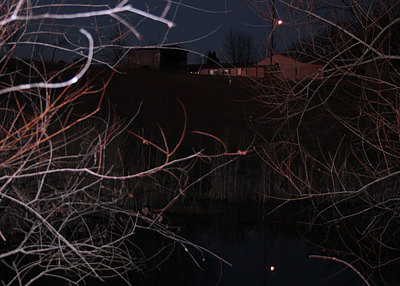 That's my tractor shed left of center, the back of my home in the middle, the kennel building on the right, and the security light reflected in the water. I'd lived in military apartments, row homes, and suburbs all my life but I had alway longed for the country. 1999 was the year that seemed to be now or never for making the move from my long time home in Westerville, a northeast suburb of Columbus. I began months of searching and, in the summer of 2000, in a rural county southeast of Columbus, I found my 39 acres of country. Living here is not convenient but it sure is peaceful. I will take the peace, the space, the whippoorwill, the bats, and the moonlit pine trees over convenience, no problem. Come to think of it, it IS convenient to be able to walk out my door and have all this room to lay tracks! Farewell, now, to my three favorite months of the year. September, October, and November always go by too fast.